Barb Wooler, of Grace Brethren International Missions, has sent an exciting update on what’s happening in ministry with the Pygmies in southern Central African Republic and northern Congo region. Barb reports, “Our goal for blanketing the forest with Christ followers and churches is coming into focus. The new church plant in the new region of the west (fruit of the AkaLand Expedition of 2004) is going great! “The church planting team of two couples are enjoying their new ministry. Pastor Louis (in yellow shirt) and Francois (pictured next to Louis), both of whom you may have met during their USA visit of 2000, are seeing conversions on a regular basis. They have started a literacy class in their new church and will be sending a Ngenze man to Bible Institute! “Back at Moale the church is doing well, but not without its struggles. They have been flooded by many people from the outside. The Moale church will be sending nine couples to Bible Institute this month! This is the culmination of many years of effort; when these couples return from their training we expect the work among the forest people to catapult into a new phase of growth and health! “These added couples also present a wonderful opportunity for involvement by small groups, ABFs, or individuals. “2 – Can’t help with financing sponsorship? You can still make a difference. 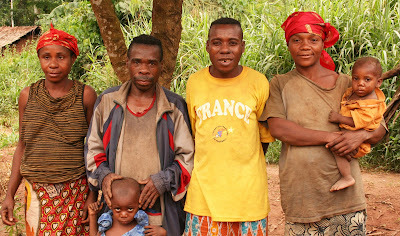 These couples will need prayer as they adjust to life “on the outside,” out of the forest. This will be as foreign to them as moving to the moon would be for you and me!